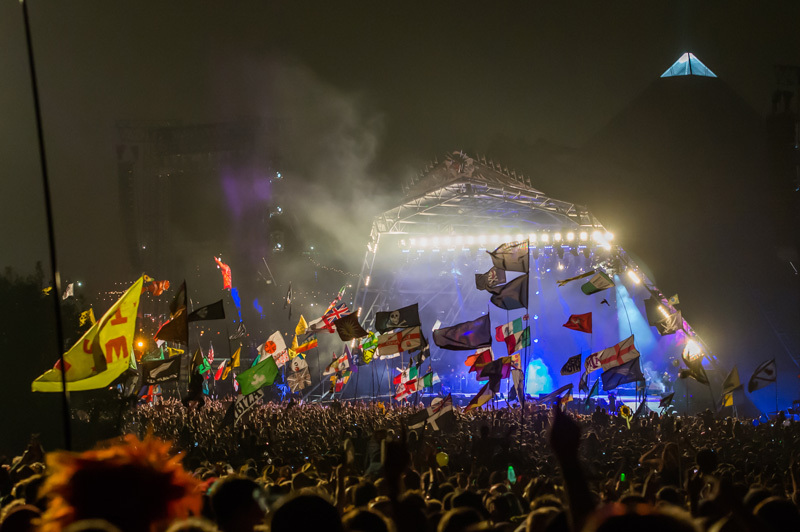 The Pyramid Stage, is the most instantly recognised festival stage in the world. Rising from the site of a blind spring close to the Glastonbury Abbey/Stonehenge ley line, it is now in its third incarnation. The first pyramid stage was built in 1971 by theatre designer Bill Harkin and his crew from scaffolding, expanded metal and plastic sheeting. It was believed that a pyramid is a very powerful shape: the apex projects energy upwards while energy from the stars and sun are drawn down. The original Pyramid resembled a diamond transmitting pure vibrations into the night. In 1981 a permanent structure doubling as a cowshed and animal foodstore during the winter months was built on the same site using redundant telegraph poles and surplus box section iron sheets from the Ministry of Defence. This Pyramid grew to symbolise the magic of Glastonbury Festival. In 1994, shortly before the Festival, it burned to the ground. In 2000 the phoenix rose from the ashes. Using designs based on the Great Pyramid of Giza in Egypt, Pilton villager Bill Burroughs constructed a Pyramid Stage four times the size of the original. The glittering 30m steel structure now covers 40m x 40m, uses four kilometres of steel tubing and weighs over 40 tonnes. All materials and processes passed a Greenpeace environmental audit. It would be impossible to put a finger on exactly what makes a Pyramid Stage artist. We’ve had old favourites and controversial surprises, the extraordinarily famous and the up-and-coming, pared down sets and huge theatrics. Whatever the intangible quality that puts a performer on Glastonbury Festival’s most iconic stage, it’s led to quite a line-up, featuring The Rolling Stones, Radiohead, Oasis, Jay-Z, Franz Ferdinand, U2, The Prodigy, Joan Baez, Pulp, Tom Jones, Neil Diamond, Shakira, Johnny Cash, Gorillaz, Dizzee Rascal, Paul Weller, Peter Gabriel, Van Morrisson, Sinead O’Conner, Bjork, PJ Harvey, English National Opera, REM, Coldplay, Robbie Williams, Beyonce, Willie Nelson, Metallica, Lily Allen, Bruce Springsteen, Pet Shop Boys, Black Eyed Peas, Morrissey, Paul McCartney, Scissor Sisters, Tony Bennet, Roger Water’s Pink Floyd, Kings of Leon, The Reverand Al Greene, Rod Stewart, Jimmy Cliff, Dolly Parton, David Bowie, White Stripes, Dame Shirley Bassey, Arctic Monkeys, The Who, Brian Wilson and many many more.